If ever a game involving Queens could be described as being a `game of two halves`, then tonight`s clash against Raith Rovers would clearly fall into that category as the home side, who were completely off the pace in the opening forty-five minutes, turned the game on it`s head and should really have taken maximum points after dominating for pretty much all of the second period, but in the end they had to settle for a share of the points. Returning to action following an enforced break of nearly 3 weeks, Queens started the game with the same team that began against Falkirk in their last outing, opting to line-up in a 3-4-1-2 formation with Alex Harris playing just behind a front pairing of Iain Russell, and Derek Lyle. 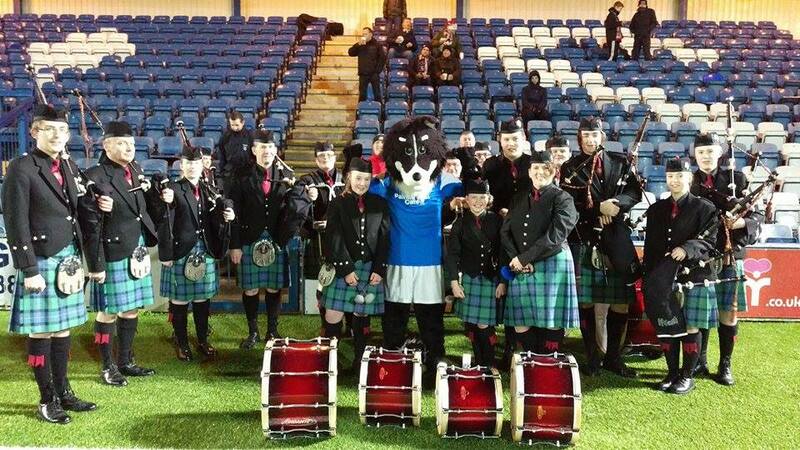 Visitors Raith,began the game two points and one place above Queens in the Championship table, but their recent spell of 5 games without a win, meant that Queens would move ahead of the Kirkcaldy side with a victory. Although the strong winds that had buffeted Dumfries all day had calmed down a little, it took the players a while to get to grips with the swirling gusts that swept across the pitch on many occasions. The opening phase of the game was contested mostly in the middle of the park, where the central pairing of Mark Millar, and Kyle Hutton were struggling to gain any meaningful possession, and as a result it was the visitors who were on the front foot early on. They forced the game`s first corner, and although the Queens defence coped well, the away team would have been encouraged by how well they started the game, and only a well timed challenge from Andy Dowie prevented them from creating a chance to take the lead. 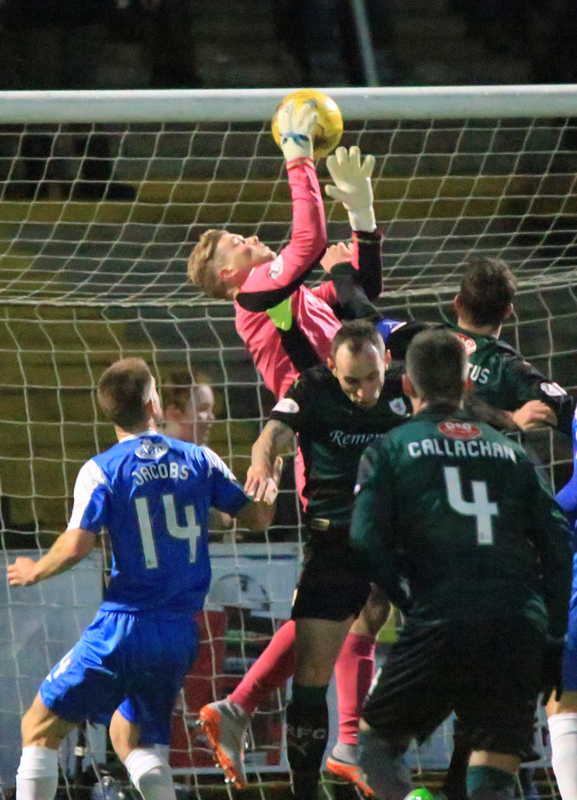 Raith were forced into making an early change when Wighton replaced the injured Anderson after 20 minutes, but that did little to affect their hold on the game, and just two minutes later they went in front following a mistake from Queens `keeper, Robbie Thomson. A long throw from the right was cleared by a panicky Queens defence out as far as Toshney, and his high looping cross back into the penalty area put Thomson under pressure from both his own defenders and Raith attackers and unfortunately for the young `keeper he fumbled the ball into his own net. There was a slight suggestion that Thomson may have been fouled by Benedictus, but there wasn`t much protesting from the Queens players and the goal was allowed to stand. The set back did provoke a reaction from Queens, and after conceding the goal they had their best spell of the half. A long clearance from defence almost found Iain Russell, and moments later Russell linked up well with Harris before his cross into the box eventually came to nothing. At that stage Russell seemed to be Queens` most likely option and he was involved in what was their best move of the half. A long ball from Dowie was headed into the path of Millar by Lyle, and Millar`s through ball picked out the run of Russell, but seemingly caught in two minds, his effort was neither a cross or a shot and the opportunity had gone. The first booking of the game went to Raith`s Toshney for a late challenge on Russell, and following the free-kick, a combination of Lyle and Dowie met the ball but could only glance it wide of the far post. Still that was better from Queens as at last they had managed to put the visiting defence under some kind of pressure, and almost on the stroke of half-time, they threatened again when Lyle flicked a header wide following good work once again from Russell. Having struggled to string more than 3 passes together in the opening 35 minutes, at last the home side were starting to create some half chances, but they went into the interval knowing that a much improved performance would be required in the second period. It`s amazing what 15 minutes in football can do. A team talk, a substitution, a change of formation, and three minutes into the half Queens had drawn level. Lewis Kidd replaced Darren Brownlie and Queens switched to a 4-4-1-1 formation with Mark Millar playing behind lone striker Derek Lyle, and just moments into this set-up the game was all square. When the ball broke to Kidd he was able to play in Alex Harris who after skipping past the last defender rolled the ball across the six-yard box where Iain Russell was waiting to tap in from close range. It was the perfect start to the half for Queens, and after not looking like scoring at any point in the opening half, it seemed as though they would score every time they ventured forward. The confidence surged through the team as they pushed forward chasing another goal. Harris sent a shot straight at Cuthbert, and Kidd delivered a perfect low cross that was crying out to be knocked in as the home side dominated the proceedings. They had another chance shortly afterwards following yet another foul on the lively Russell. Millar`s delivery was flicked on by Dowie into the path of Chris Higgins who in turn set up a shooting chance for Russell but his effort went just wide. Many of the home fans in the crowd of 1047 thought that they might have had a penalty when Russell appeared to be barged off the ball, but although referee Charleston did blow for a foul, it was against the Queens striker rather than for him. 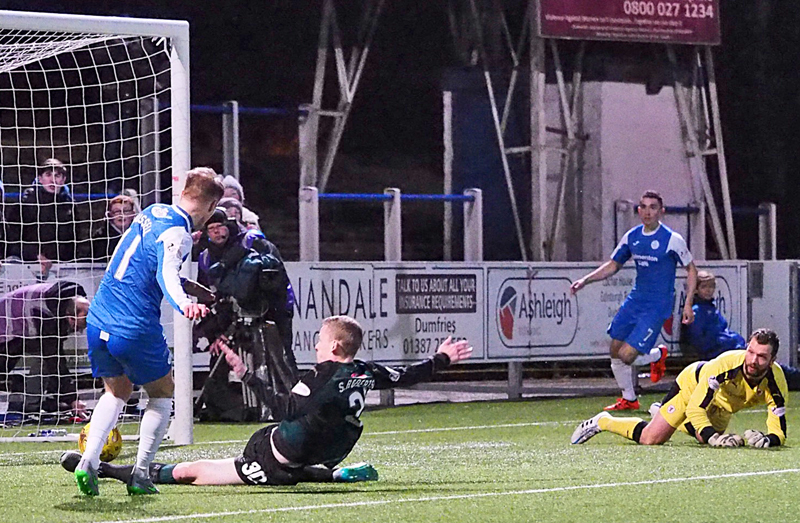 Queens were well in control and Higgins went close to putting his team in front when he met Millar`s corner, but his near post attempt was deflected wide for another set-piece. This time Millar`s delivery was cleared out as far as Harris, but the Hibs loanee was off target with his strike. With Queens looking the most likely of the teams to find a winner they had another opportunity to go in front once again following a free-kick. Jordan Marshall was fouled by McCord, and from 30-yards out Millar`s shot went straight into the wall and when the ball broke back out to Harris, he was very unlucky to see his shot curl just wide. As much as Queens were controlling the game, and with Raith hardly managing to get anywhere near Robbie Thomson`s goal, there was a huge let off for the home side when a Raith attack ended with Wighton sending his shot from 12-yards out straight at Thomson. 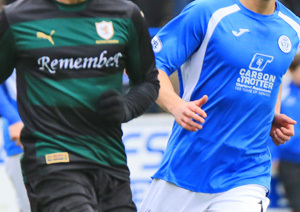 Queens made their first change on 74 minutes when Gary Oliver replaced Mark Millar, and not long after coming on, the substitute had what was Queens best chance of the second half. A superb flicked header from Lyle sent Oliver through on goal but his shot was straight at `keeper Cuthbert who reacted well to push the ball away. Just before that chance, Ryan Conroy had replaced scorer Iain Russell for the final eight minutes and although Queens continued to press for the winner, only a half chance from Oliver in the final minute came close to gaining them the win their second half performance deserved. Sponsors choice for man-of-the-match went to Alex Harris, and at the end after gaining a decent enough point, the fans around me were all asking the same question. Why didn`t we play like that in the first half ? So Queens ended their home campaign for 2015 with a point, but it could have, and should have been all three.